Erlebnis-Hotel Appartements Wellness and Sport **** - Carinthia - Latschach am Faaker See South - Roadbike Holidays and active holidays on the lake from its most beautiful side. Lake Faak is Carinthia’s fifth-largest lake and is situated south of Villach. 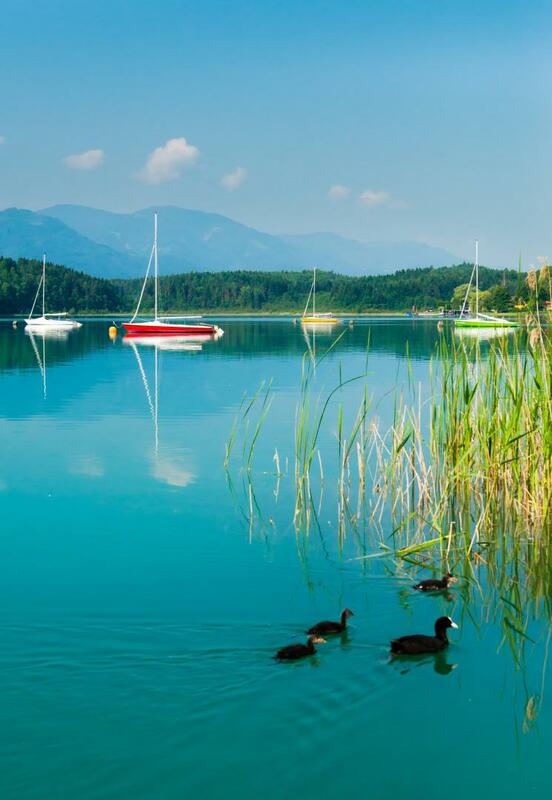 Its turquoise-blue waters make it one of Austria’s most popular swimming lakes. Lake Faak is surrounded by gentle hills and forests. Its deepest point is around 30 m and, thanks to the sandy bed, its waters are crystal-clear, clean and of drinking water quality. A swimming facility, vast and lined by shade-providing trees, at probably the most beautiful beach of Lake Faak is available free of charge for guests of the Adventure Hotel Pirker. 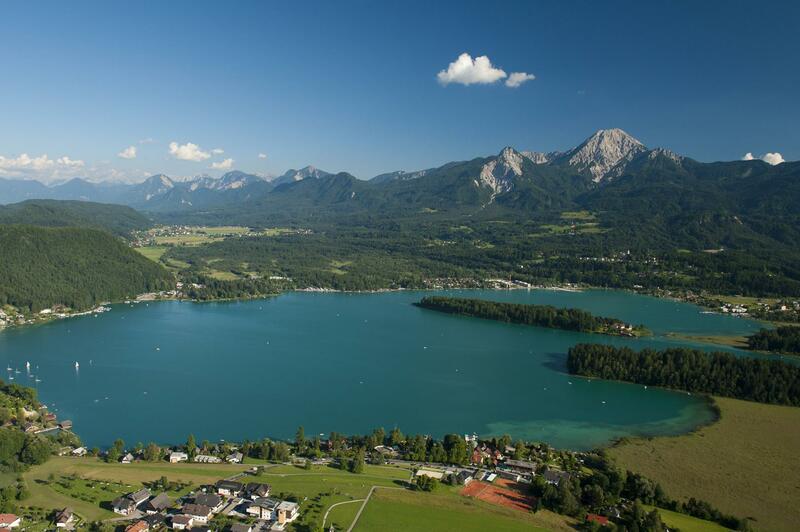 The highest accolade: Lake Faak has been named Austria’s cleanest swimming lake! flat, inclining sand-pebble beach - ideal for children and toddlers – safe, shallow shore, water of drinking water quality. Lake Faak freezes over almost every winter and its beautiful sheet of ice invites to ice skating, iceboating and ice surfing. More and more families with children spend their holidays at the crystal-clear Lake Faak. The free of charge swimming facility, which is provided for our guests, has one of the most beautiful beaches along the entire lake and is ideal for your family holiday. Visit the neighbouring pasture with your children: sheep, goats and horses are waiting for your visit. Our chef will happily provide you with some treats for the animals. The many playing possibilities around the hotel leave no time for boredom. The nearby riding stables offer special holiday programmes: parents are pampered at the hotel and the children experience unforgettable adventures with horses in the great outdoors. We are delighted to provide you with further details. Chess place, table tennis facility; and lots of room to play, romp, hide or catch. Balls, badminton or table tennis rackets and Bäller you receive free of charge at the front desk; also games for in there are to borrow! You will never be bored. And WLAN is available anyway! To chat, skype, surf and always be online - for free! The equestrian center nearby offers special holiday programs: parents can be pampered in the hotel and the children experience unforgettable adventures with horses in the great outdoors. We are happy to give you more information. But also varied walks allow children to marvel and get to know nature. There is so much to discover in the forest and on mountains! Super Bargain Family Week at the Erlebnis-Hotel!